Finally, the weekend with a little relax time! Except for the war going on behind me listening to hubby play Call of Duty: Black Ops in full surround sound glory. :-) I’ve caught up on some much needed laundry and yard work and it feels good to have that out of the way. When I got home from work last night, I was fried, stressed and drained. Ready to write the week off, but not necessarily cook and clean the kitchen. 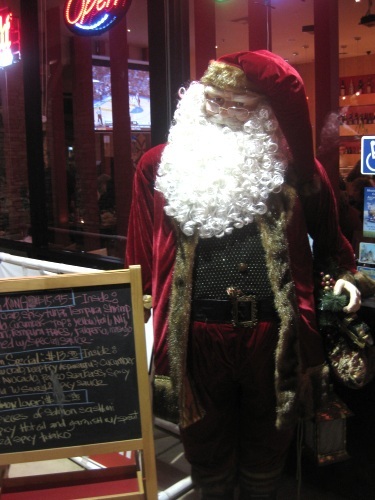 So hubby and I stepped out to our favorite local sushi place where we were greeted by a creepy Santa! Where do they store such a creepy thing? He’s not exactly jolly looking. The entire place is tricked out for Christmas already with Christmas trees and decorations. On one hand it was kind of fun seeing the it all, on the other it felt a bit early and reminded me that I still have a lot of Christmas shopping to do! I’m not really a beer drinker because there are very few I actually like. 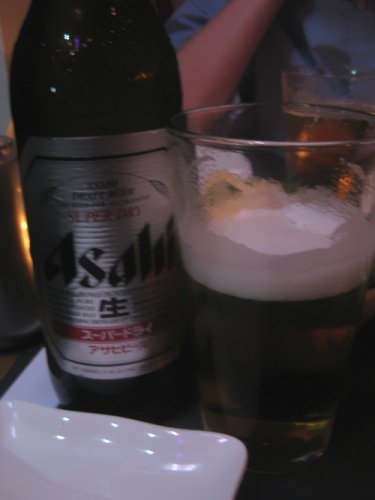 But Asahi is one of them and my favorite beverage with Japanese food. When I first started a high-raw diet, I worked very hard to skip alcohol all together. I thought it’d be easy since I’ve never been a huge drinker only having 2-4 a week and my alcohol tolerance is so low. But there’s just too much good wine and beer out there to completely deny myself. I’m finding myself back to enjoying a drink or two on the weekends again. 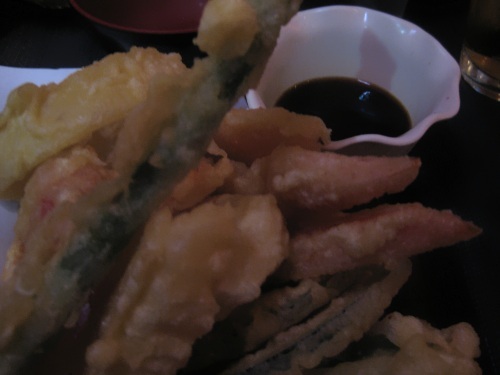 And I also indulged in another rare splurge for me – vegetable tempura. Traditionally tempura batter is vegan, but some places might put eggs in the batter. It’s worth asking if you’re concerned about that. I can only get through about half of this before I start picking the fried shell off and eating just the vegetables dipped in the sauce because the fried batter is so rich. Tempura is a childhood comfort food for me. While growing up in the bay area, we used to have family tempura nights sitting around a deep fryer while my parents served out the fresh pieces. That was also rare, but fun. 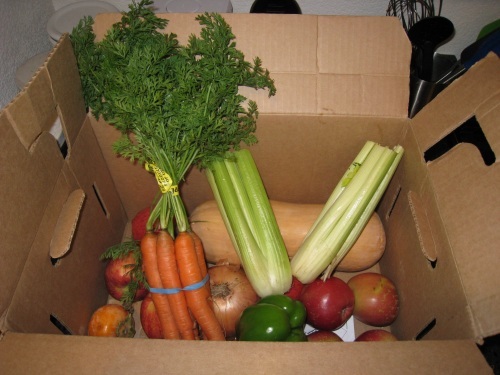 Last week, my hubby surprised me by signing us up for a CSA farm box when a guy came to our door selling the service. I’ve been considering doing that for awhile, but never got around to it. 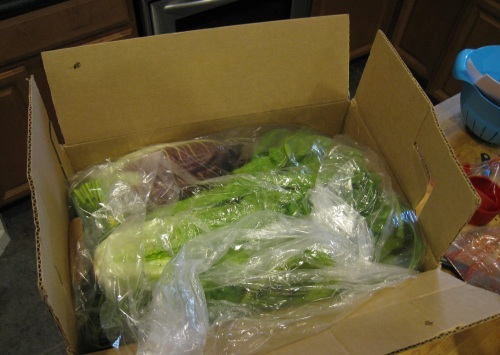 We got our first delivery this week and it was a pleasant surprise packing a lot of produce I haven’t worked with in awhile, like turnips, leeks, mixed greens and persimmons. The butternut squash is huge, I could probably get a few meals out of that one! 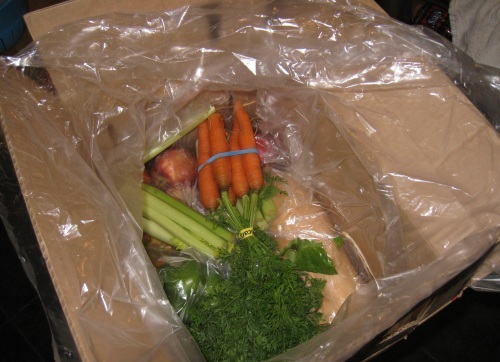 I’m looking forward to the variety and challenge of using the seasonal ingredients that are new to me and I like having fresh produce dropped off at our front porch, I was out of carrots and apples when I received this – perfect timing! Blend all ingredients in a high-speed blender to a smooth puree and pour into wok with stir fry ingredients. 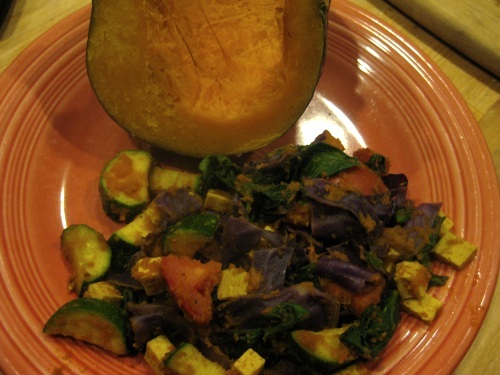 I sauteed the sauce with tofu cubes, red cabbage, fresh spinach, zucchini and tomatoes. The sauce came out great, rich curry flavor that coated nicely without being over-powering. Carrots just seem to work well with curry and the texture makes a great puree for sauces, much better than tons of oil, flour, cornstarch and who knows what else you might find in store-bought curry sauces. And it was super fast to create, I had dinner ready and the Vita-Mix cleaned within 15 minutes. Now I have a very bored chihuahua giving me the evil eye because it’s time to take her on a long walk before going out tonight. Have a great Saturday! 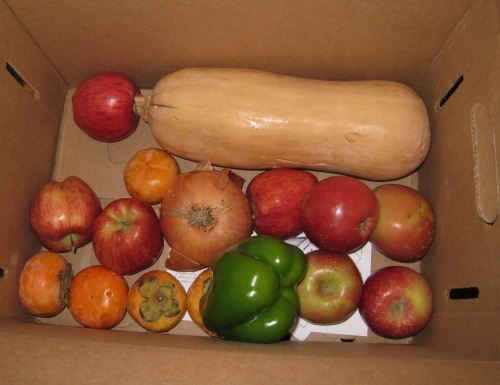 THAT is the #1 blessing (and i admit a smidge of a curse) of a CSA box. 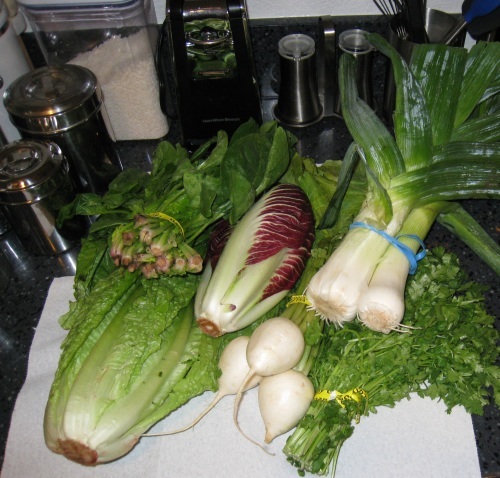 I am not a fan of onions and leeks so those were always donated to someone else but exotic greens, root veggies, you name it, CSA’s in CA are wonderful for making you put your thinking cap on! Leeks will be a challenge for me because I haven’t worked with them too much yet, I need to find a good recipe to try. Aww, I miss being part of a CSA! It’s awesome! I like to pretend it’s an episode of Chopped or Top Chef, and try to come up with something interesting…or just hit up the internet if I’m scared of making something horrorific. Oh, forgot to add–I want to try that curry sauce! I just happen to have carrots that need using. But I only have baby carrots…about how much would you say that equals? It’s gonna be fun trying to use up new veggies, I’m thinking a raw spiralized salad for the turnips and still trying to figure out what to do with the leeks. 6-8 chopped baby carrots should work fine for the sauce. 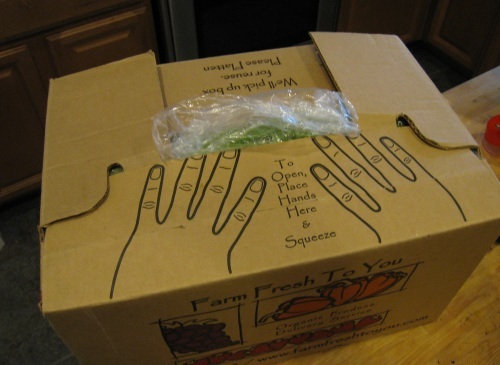 I was looking into getting one of these boxes too but I live on my own right now and veggies go bad so quickly (even though I eat tons.. there’s only so much I can do ;)). I’m a little worried about not using it up enough too. But smoothies are great for consuming veggies that need using up, think I’m gonna try butternut squash chunks in mine this week. Lol…that santa looks like he’s putting everyone on his naughty list. 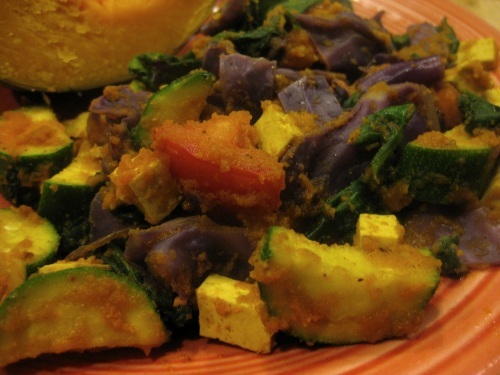 I love vegetable tempura– I haven’t had it in forever! Now that I’m vegetarian, we don’t visit sushi restaurants nearly as often as we used to. I’ve been enjoying sushi places a lot since cutting meat because they seem to have different vegan rolls and I can always go for veggie tempura, edamame and seaweed salad – yum!